Folks, it is time to celebrate. On June 27th, Google have issued an update to PageRank for the second time this year (First update happened in January 2011) and guess what ?? 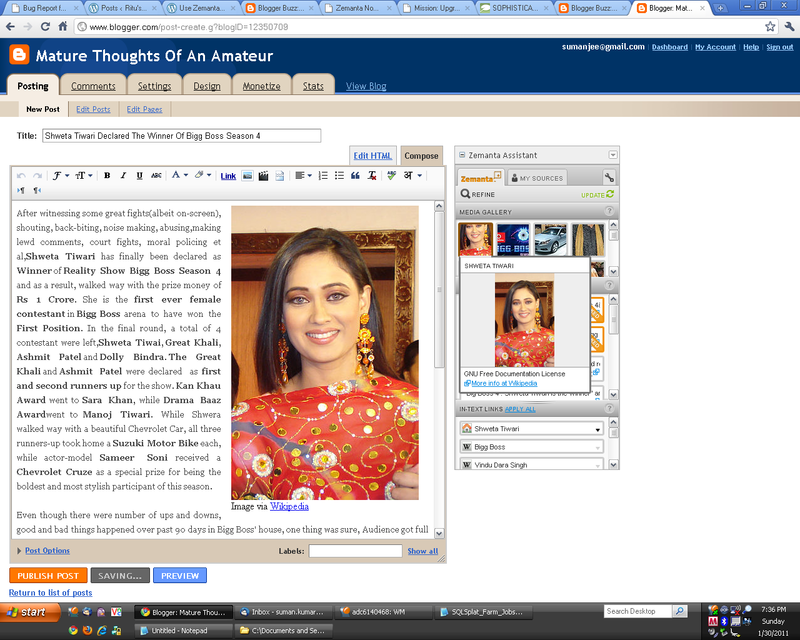 [Ritu’s Corner aka RituSays] has just got its first page-rank :-). Prior to this update, its PageRank was N/A (Not Available), but now its PageRank has increased to 1. Last time, when we wrote about this blog’s popularity and hit-counts, calling for cheers and celebration, we had just crossed 500 hits mark, today we have clocked ~ 24000 Hits, with an average hit-count of 200-250 on a daily basis. Needless to say, we are happy and we are pretty sure, so are our readers. This updated Google PageRank has definitely motivated us a lot. We hope to continue with our exploits in coming months and be more regular with our blog posts. Thanks to everyone, who visited our site. We hope, you will continue doing so and find our blogs useful. In one of my earlier blog-posts, I had talked about Blogging Assistant Zemanta on WordPress and how it can help you spice up your blog by enriching it with full of Relevant Hyper Links and Images. Well, the good news is, Zemanta is now available on Blogger/BlogSpot as well. So if you are blogging on Blogger and need assistance in finding and inserting Related Articles/Blog-Posts or Images and Hyper Links relevant to your Blog-Post, you have reasons to be happy. You have Zemanta as your Blogging Assistant, yes an assistant literally 🙂 Here are things you can and cannot do with Zemanta on your Blogger Blog. What it can do for you ?? 2. Related Images : It will again look up on web and try to find out related images on Web based on your content and give you a list of images to choose. If you want to add any of these photos to your blog, just click on it and they will automatically be added to your post. Note : All the screen-shots presented here are for a blog I wrote recently on “Shweta Tiwari Declared The Winner Of Bigg Boss Season 4“. What it can’t do for you ?? Unlike WordPress wherein Zemanta recommends a set of Tags for your blog-post, Zemanta when used on Blogger BlogSpot Blogs doesn’t generate a set of labels (Similar to tags on WordPress) automatically. 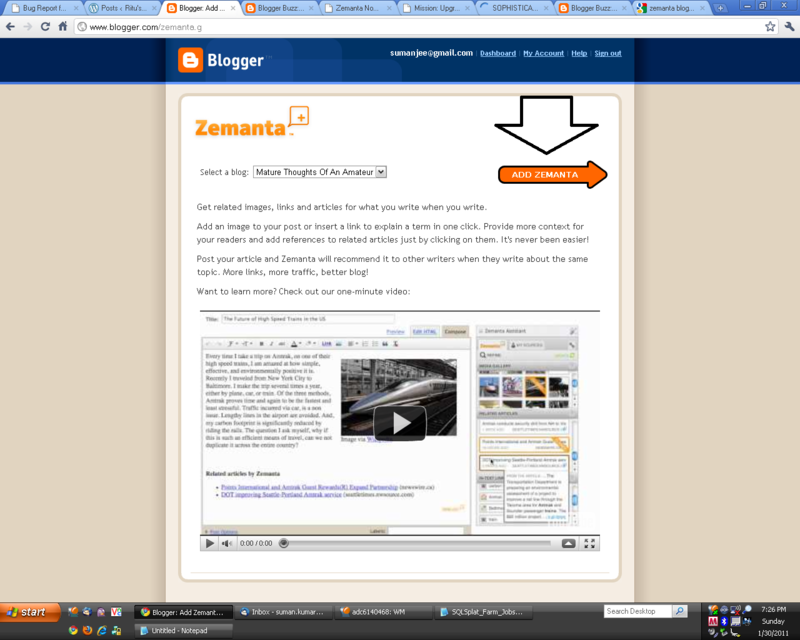 How to Enable Zemanta For Your Blogger/BlogSpot Blog ?? Are you one of those, who have been blogging for a while on Blogger aka BlogSpot and somehow felt that your blog lacks something, may be that Killer Punch, may be a Dashing Design, which can catch its visitors’ attention. Yes, there comes a time, when you make that decision to switch to WordPress. You were possibly attracted by a plethora of easily Customizable WordPress Themes or the cool widgets, which let you do almost everything you want to do. If you are planning to migrate your blog from Blogger to WordPress, but worried about the whole process of importing blogger posts with comments into WordPress, just take a deep breathe and calm down. It is ridiculously simple to migrate. In fact, its so easy that you won’t stop laughing at the end of it !! That’s it !! Yes, you are done 🙂 All your Blog-Posts, Comments, Categories (Blogger Labels) and Users will be visible in WordPress in few minutes depending on the size of your Blogger Blog. You will also be glad to know that all your Blogger Blog-Posts’ Date and TimeStamp are preserved and don’t require any action from your front. In one of my earlier posts, I had talked about “Transferring a WordPress Blog to Another WordPress User or WordPress Account“. Today, I am going to talk about the same thing Transferring Blogs only, but on a different blogging platform that is Blogger aka BlogSpot. Yes, Blogger also allows Blog-Transfer Across Blogger Users, so if you don’t need any blogname, you can pass it onto someone, who may need it. Unlike WordPress, Blogger doesn’t have a “Transfer Blog” feature allowing direct transfer of blogs across WordPress users, but it still allows us to achieve the same objective via Guest Blogging Route. Here are the steps on “How to Transfer A Blogger/BlogSpot Blog to Another Blogger/BlogSpot User or Google Account“. Step 1. First you have to add the person, to whom you wish your blog transferred to, as a Guest Blogger to your blog. 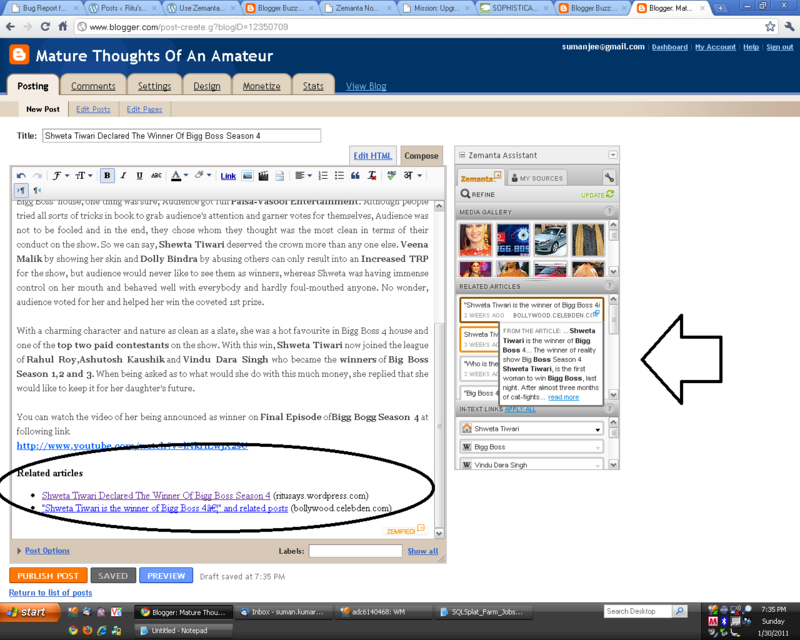 Steps on how to do that are explained in one of my earlier posts about Guest Blogging on Blogger. Step 2. Once you have added the person as a guest blogger, Go to Dashboard -> Settings -> Permissions, it will show you a list of current Blog-Authors. This will include you as well as the person, whom you have just invited for Guest Blogging. Step 3. Click on “grant admin privileges” link, it will throw a pop-up warning you of the consequences of Granting Admin Privileges to a Guest-Blogger and confirm the action from your side. Step 6. Click on “Remove Blog Member” and you are done with your blog-transfer !! The blog stands transferred to the other Admin user. Next time, you login to your Blogger/BlogSpot account, you will no longer see this Blog underneath your name. Step 3. 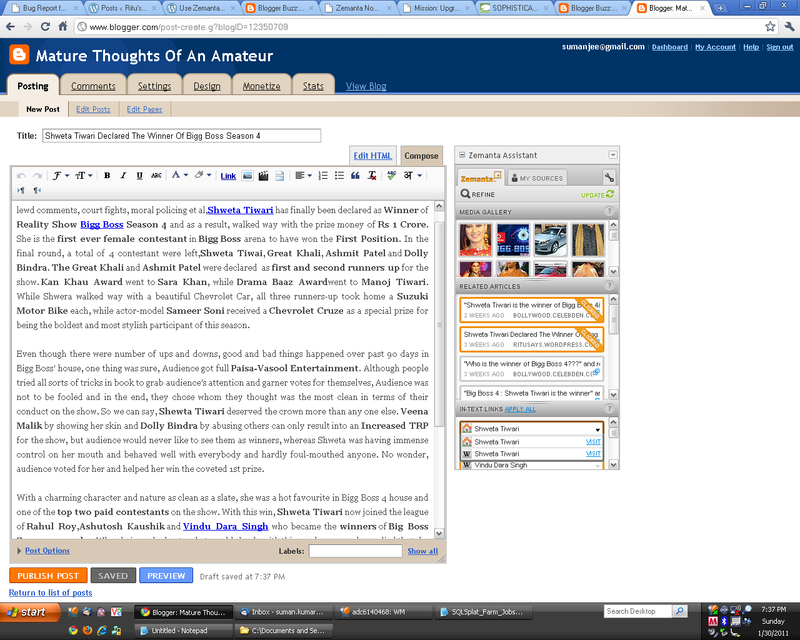 Now you’ll see your name along with your gmail address, listed as Blog Author. Step 4. 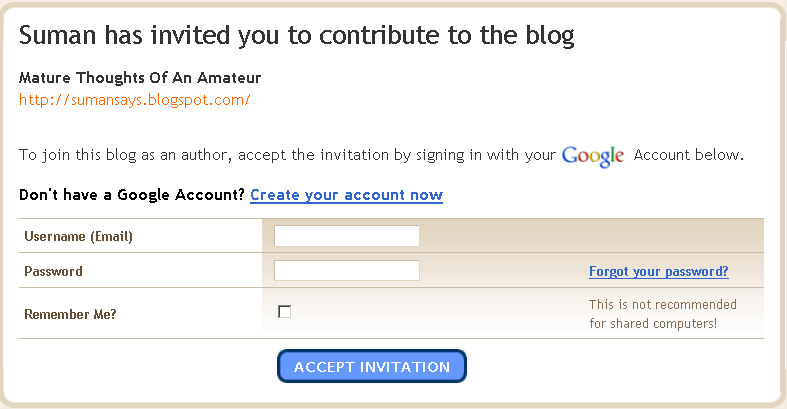 Click on Add Authors and enter the email address(es) you wish to be guest author(s) on your blog and click on Invite. If you are entering multiple invites, you can specify a comma separated email addresses list. Step 6. After your invitation is sent, your invitees will all be receiving a mail to be a Contributor on your blog. Step 7. Once they click on the “To contribute to this blog” link provided in the email, they will be taken to Blogger home-page asking them to sign-in. If you are a google account (Read gmail) holder, you can straight-away enter your credentials and sign in. If you don’t have a google account, you will have to create one, which you can use to sign-in to Blogger.